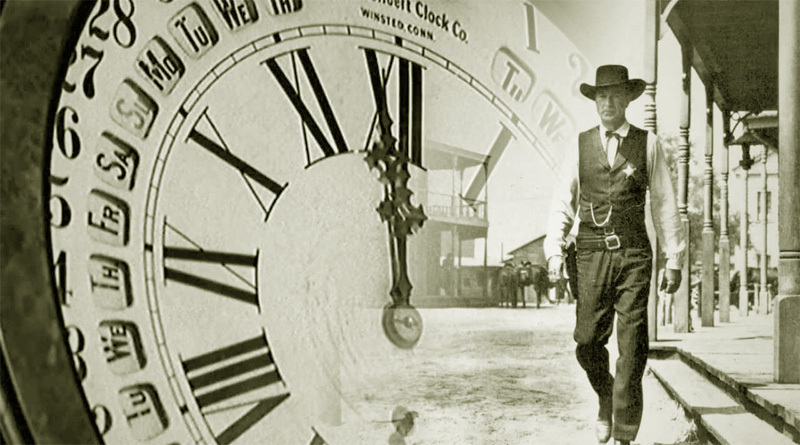 By Earl Holt III — High Noon has rightfully been called the first “adult” western. Its characters are not the typical, one-dimensional caricatures of earlier, traditional westerns, where “good-guys” wore white hats and villains wore black hats. Instead, the characters in High Noon are far more complicated, more interesting and more human than those of previous efforts. Although at one level, the film is a variation on the traditional “Western” formula, replete with symbols of good and bad, a requisite moral “code”, and other essential elements. However, on a grander scale, the movie is nothing less than a study in human nature: It illustrates how most individuals in a civil society tend to perceive and respond to serious external threats. Indeed, it demonstrates how creative human nature can be when rationalizing its own timidity and inaction, particularly when action is warranted but poses inherent risk. In this regard, the film is timeless in its applicability to the issue of leadership in a free society. Nowhere does the timelessness of the film seem more apropos than in the context of the Cold War and the threat posed by an expansionist Soviet system in the latter half of the 20th Century. And nowhere has such courageous leadership been more profoundly demonstrated than by Senator Joseph McCarthy, the man who sacrificed everything to investigate and publicize the extent of Soviet penetration and subversion of the Roosevelt and Truman Administrations. The tranquility of Hadleyville, a small, western town is suddenly disturbed when its residents learn that a notorious murderer and his gang plan to return and avenge themselves against the town’s Marshall, Circuit Judge, and others who participated in their arrests and convictions. Inexplicably, the gang’s psychopathic leader has been pardoned by the state’s Governor — despite his murder conviction and death sentence — and plans to return in mere hours to reunite with his former gang and seek the revenge he vowed years ago. The timing of the gang’s reappearance could not be worse from the standpoint of the town’s safety: Its Marshall — who is largely responsible for having restored law and order to the town — has retired that very day and plans to leave with his new bride to begin a second career as a shopkeeper. Moreover, the Marshall’s replacement is not due to arrive until the following day, leaving only an unreliable and immature Deputy Marshall to protect the town’s residents. Worse yet, the Deputy is enraged at having been passed over by the town’s Selectmen in their search for a new Marshall to replace his departing boss. Much of the movie consists of the Marshall’s fruitless efforts to enlist his fellow citizens to help him counter the imminent threat this murderous gang poses to every resident. And, while the Marshall’s moral code will not permit him to abandon his friends and neighbors, even though officially retired, these same people spurn his appeals for assistance. The reaction of his friends and neighbors astonishes and then angers him: He discovers that the same people for whom he has restored law and order and for whom he continues to risk his life will, in return, do nothing to aid him. Yet, in rejecting his pleas for help, it is tacitly understood that to face the gang alone will mean almost certain death for Marshal Will Kane. Yet, the common denominator in the town’s inaction is a refusal to view this external threat in an objective and realistic manner. To add insult to injury, the Marshall’s new bride is a Quaker who, owing to her pacifism, threatens to leave the Marshall if he insists upon taking up arms and confronting the gang. The plot in High Noon is very much like its later incarnation in Clint Eastwood’s “Dirty Harry”: In both instances, the lawmen are the only ones who stand between psychopathic murderers and the innocent public both men have sworn to protect and defend, yet, their efforts are betrayed at every level by the very people whose cooperation is necessary to counter the threat. In the film’s denouement, the Marshall prevails against all four gang members by virtue of his experience, skill and cunning, with one exception: Realizing that her husband will be gunned down in the street without her intervention, the Marshall’s Quaker wife seizes the opportunity to dispatch one of the four villains by shooting him in the back, just as he takes deadly aim at her husband. Her epiphany may very well have come from the sudden recognition that her pacifism can only exist when others are willing to take up arms and risk their own lives in defense of her naïve idealism. In any event, her action saves both their lives and permits the newly married couple to reconcile, perhaps with a new and greater appreciation for each other. Marshall Kane permits no such reconciliation between himself and his former neighbors: When he finally guns down the gang’s leader, the town’s residents swarm back into the streets out of curiosity. As a final demonstration of his contempt for a town that turned its back on him in his (and their) hour of need, the Marshall pitches his badge into the dirt and dust of the street, before he and his new bride leave Hadleyville, presumably forever. Ironically, many communists exposed by the House Un-American Activities Committee — and later, Senator Joseph McCarthy’s Permanent Subcommittee on Investigations — cited High Noon as a metaphor for their own predicaments. Self-servingly, most tended to view themselves as modern-day Marshall Will Kanes, guilty only of attempting to warn their neighbors of the perils of “Fascist” American law-enforcement. The success they achieved in disseminating this fraudulent and ludicrous comparison is an indication of the extent to which Soviet Intelligence had successfully penetrated America’s News Media and Entertainment Industry by that time. While such comparisons are outrageous and phony in light of historic hindsight, the successful appropriation of the film’s moral lesson by America’s sworn enemies was an early example of their ability to overwhelm and obscure the truth, as they have so artfully done with many “Big Lies” prior to the evolution of an alternative media in the U.S.
Marshall Kane was attempting to defend and protect his neighbors from the ravages of an external threat – much like the threat the Soviets posed – but was certainly NOT engaged in subverting and destroying the town of Hadleyville. On the other hand, subverting and destroying the U.S. is exactly what communist apparatchiks in Hollywood and the federal government WERE busily engaged in doing to America’s experiment in democracy and self-government. If any serious comparisons are warranted, Joe McCarthy is a far more appropriate “fit” for the character of Marshall Will Kane: Senator McCarthy’s courage, patriotism and vision have now been established beyond even the slanderous disinformation campaigns of Moscow Intelligence and the truly artful liars among its stable of McCarthy accusers and adversaries. Termed “VENONA,” these transcripts demonstrate beyond any doubt that Joe McCarthy could not have been more accurate in his warnings, and that he was one of America’s greatest and most courageous patriots. Likewise, even McCarthy could not have known that many of his loudest accusers were also assets of Soviet Intelligence, nor could he have recognized just how extensively the Soviets had penetrated America’s earlier vestiges of the Corrupt Leftist Media at the time. The capacity of communists and other pathological liars –- such as the Corrupt Leftist Media and Hollywood Shylocks — to dominate popular culture with profoundly fraudulent and strident disinformation campaigns is a recurring phenomenon throughout recent America history, and it wrongfully led to McCarthy’s own tragic demise. While it is too late to avenge the injustices done to a great and courageous man, and far too late to bring the many culprits to book, it can never be too late to set the historic record straight. In this sense, comparisons between Senator Joe McCarthy and Marshall Will Kane are particularly useful. Unfortunately, the real world rarely affords the perfect endings found in Hollywood films, and it would take another 30 years before the moral heirs of Joe McCarthy and Will Kane finally ended the imminent Soviet threat.